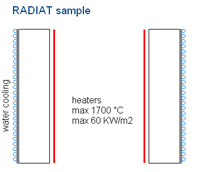 This expansion provides simulation of special heat transfer conditions both on the hot and cold side. 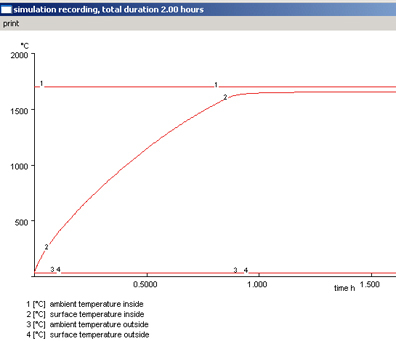 It is based on a formula interface intended to add easily calculation formulas for heat transfer coeffi-cients. The calculation is bases on an individual set of parameters for each of the formulas. In this way the software can be customized to new requirements without changes in the core parts of the calculation algorithms. All formulas can be used in steady state and in transient simulation. The soil under a large furnace is cooled by a layer of tube shaped air ducts, 20 meters long. Distance of the tube axis is 0.7 meters. 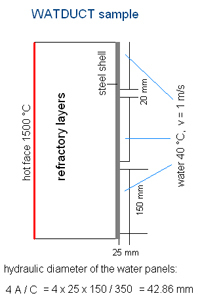 A refractory lining is cooled on the cold face with wa-ter panels 25 x 150 mm inside cross section. 1 m/s. The length of the water flow is 10 m.
Simulation result: the maximum inside temperature is reached after about 1 hour. Heating up a furnace is performed with 20 kW gas burner capacity per square meter wall. Due to the limitation of the burner capacity, there is a large difference between the flame tempera-ture and the surface temperature. Note that the curve of the inside surface temperature has become very smooth.